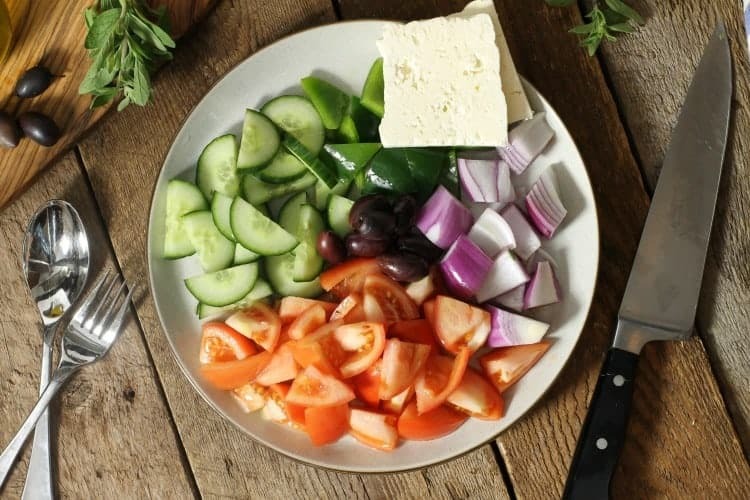 Easy, fresh, and full of flavor, traditional Greek salad takes just minutes to prepare. Serve it for lunch or dinner along side some oven baked chicken breasts, or beef kofta kebabs for a deliciously simple, yet healthy meal. 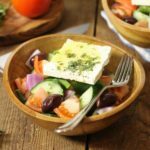 When it comes to Greek salad , everyone generally has the same impression of what it should include. Fresh tomatoes, cucumber, red onion , crumbled feta, and kalamata olives served on a bed of romaine lettuce with an olive oil based dressing. What you may not know though is that this is actually an American variation of the ‘real’ Greek salad. A truly authentic Greek salad doesn’t actually include any lettuce, crumbled feta, or fancy salad dressing. What Makes It A ‘Real’ Greek Salad? 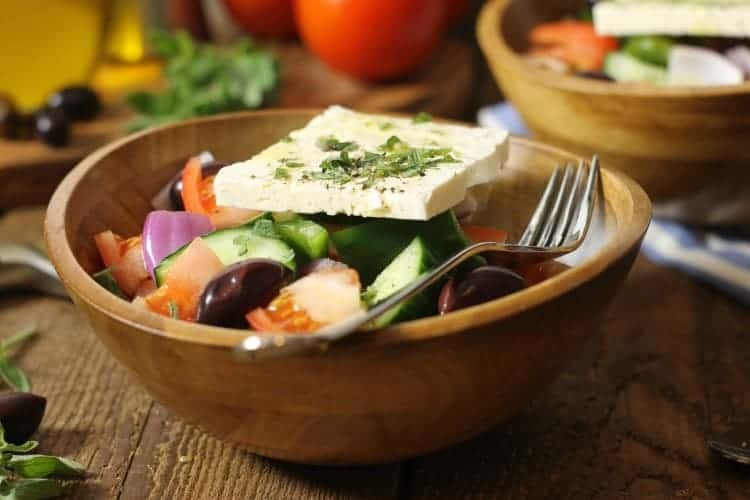 Horiatiki, which roughly translates to ‘rustic salad’ or ‘peasants salad’, is traditionally served across Greece as a light breakfast or lunch dish, using only easily available produce. Large diced tomato, cucumber, red onion, black kalamata olives, and a thick slice of sheep’s milk feta (it’s never crumbled! ), are seasoned with salt, oregano, and a splash of olive oil. Occasionally some vinegar may be used to spice up the salad further, but that is it. The salad is traditionally also never mixed or tossed together before serving, and is usually served on a flat platter, (making it easier to spoon portions into your own bowl) with some rustic bread served along side to soak up the leftover juices. Of course there are always variations of the traditional Greek salad depending on what is available, and which region of Greece you are in. Some variations of the salad may include capers, soft white cheese, or green peppers (as this one does). The American variation of Greek salad is often served on romaine lettuce and includes red bell pepper as well as crumbled feta cheese. 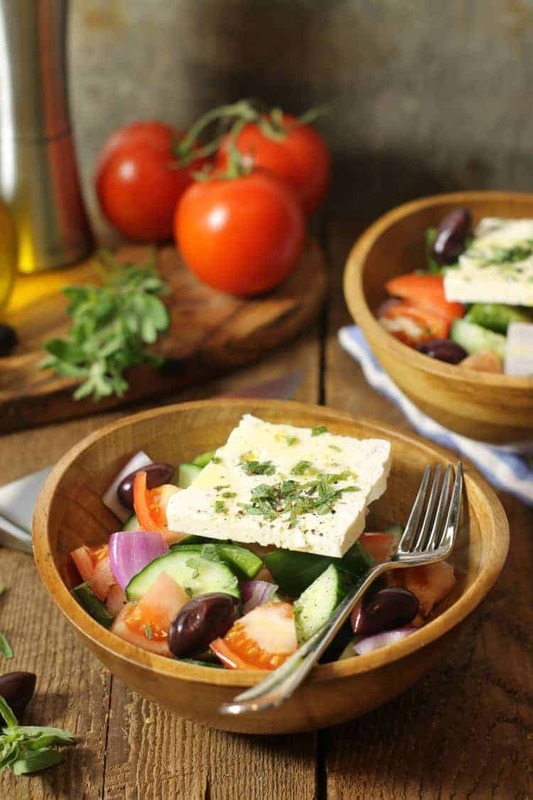 The simplicity of a traditional Greek salad recipe lends itself well to anyone growing their own backyard vegetables. Tomato, cucumber, oregano, and bell peppers are all easily grown even in small spaces, and red onion can also be home grown quite easily. All that’s needed to make this tasty dish then are a good quality feta cheese, and kalamata olives. Even if you don’t grow your own vegetables, the basic ingredients of this salad are ones that most households already have on hand, making it a simple and delicious dish anyone can easily prepare. Start by washing all the vegetables, especially if they are homegrown. Measure out the oil and vinegar, as well as the oregano. If using fresh oregano, pick the leaves of the stem, and roughly chop the leaves. 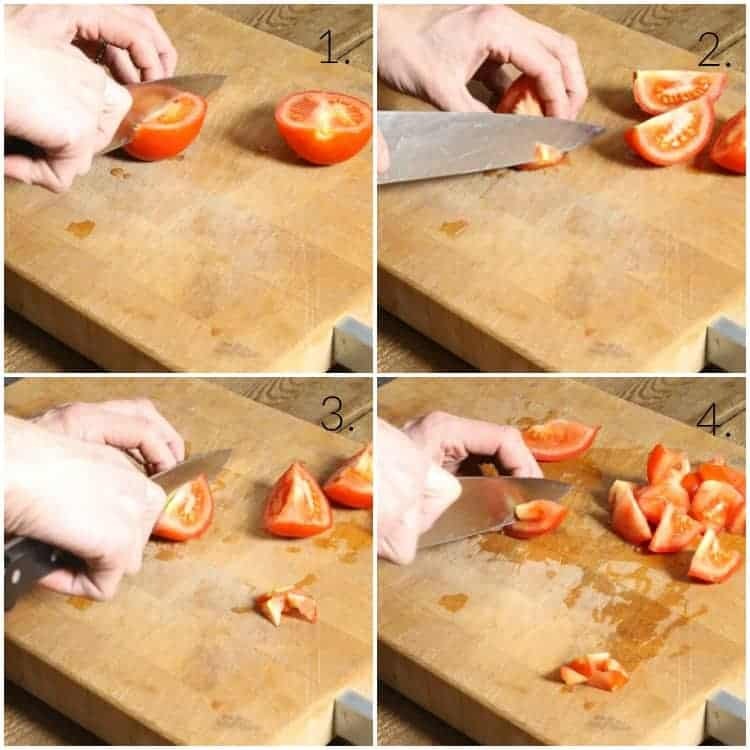 Cut the tomatoes by cutting them in quarters, removing the core and then roughly dicing them. Cut the cucumber by trimming off the ends, cutting the cucumber in half length wise, and then slicing the cucumber along its length. 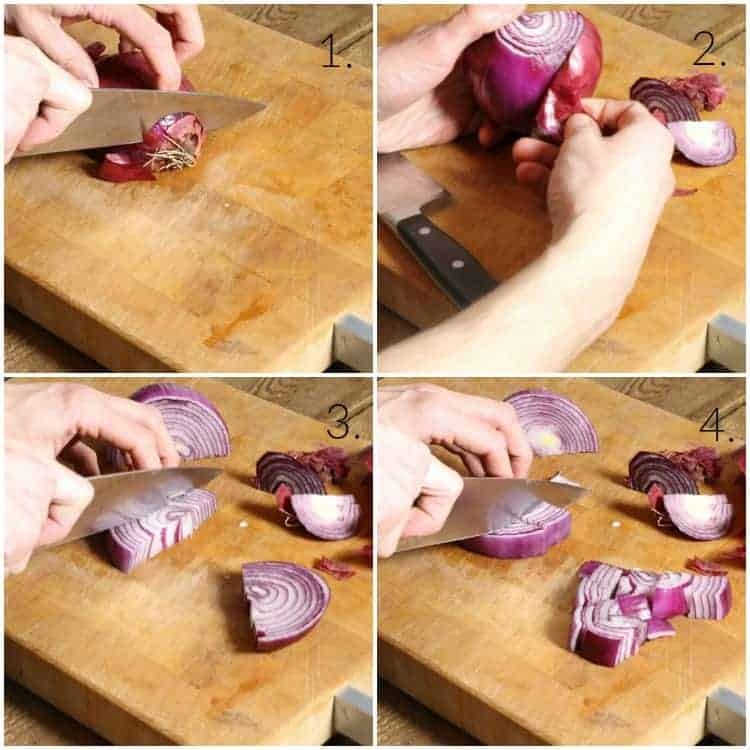 Cut the red onion in half, trim of the ends, remove the skin, and then cut the onion into a bite sized dice. Cut the bell pepper by removing the top and bottom, followed by cutting around the core to remove it. 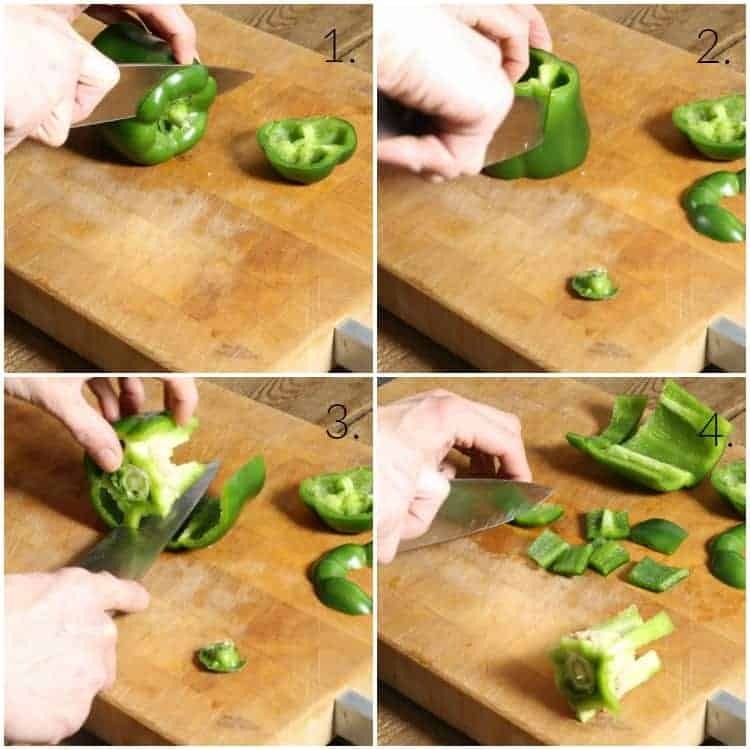 Cut the green pepper into a dice or small triangle pieces. Cut the block of feta cheese into four equal slices, and set aside. Count out 16 kalamata olives and set them aside. If serving the Greek salad on a large platter, arrange the vegetables in layers or sections, and top with the feta, and kalamata olives. Drizzle the olive oil and red wine vinegar over the salad, and then garnish with a pinch of salt, and the oregano. 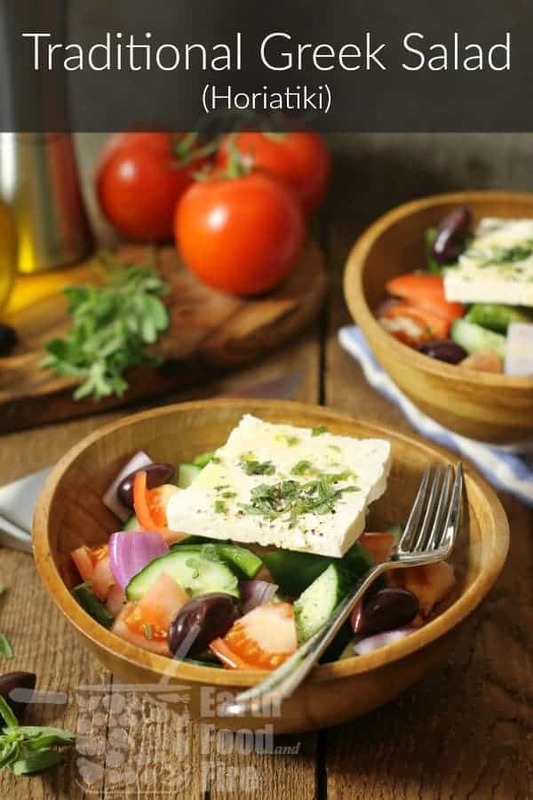 If serving the Greek salad in individual bowls, evenly portion each vegetable into the bowls, drizzle with the oil and vinegar, and then top with a slice of feta and 4 olives. Again, garnish each salad with the chopped oregano, and salt. A traditional Greek salad made with only fresh tomato, cucumber, red onion, bell pepper, and olives. Topped with a thick slice of feta, fresh oregano, and olive oil this simple, healthy, and delicious meal can be enjoyed within minutes. Keyword does real greek salad have lettuce?, greek salad, horiatiki, what's in an authenitc greek salad? 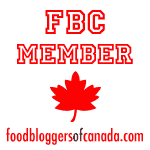 How interesting to finally learn about a real traditional Greek salad! I must try this! This is EXACTLY what I remember being served in Athens, and I don’t think I’ve had a Greek salad as tasty as that one was since! Thanks for sharing how to make it authentic!